Dad By The Sword might have the best premise I've heard all year. 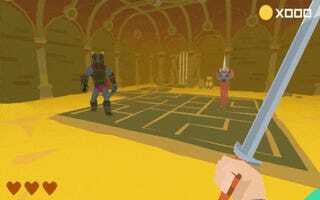 "Dad By The Sword is a First Person Sword-combat game about YOUR DAD running around in jean shorts as he slays Anti-Dads with a claymore and various other Dadcessories (Dad Accessories). Outsmart hordes of enemies, find weaknesses in their defenses, then use precise swings to slice them in half." "This game started off as a design experiment about trying to make an interesting swordfighting game. Then the dad jokes got way out of hand." What this means, though, is that it sounds hilarious (hotdog monsters are anti-dads out of vengeance because dads grill so many hotdogs, etc) and looks legitimately fun to play. Sword fighting with both disarms and dis-arms? Yes, please. Good first-person sword combat is exceedingly hard to come by in games, and this looks to scratch that itch handily—by which I mean "scratch" someone's hand clean off their arm. Binding of Isaac-style randomized dungeons don't sound too bad, either. It is cool when joke games emphasize both the "joke" and "game" parts of the title.